It was that kind of thinking that got Cornell graduate student Hao Shi excited about outreach. 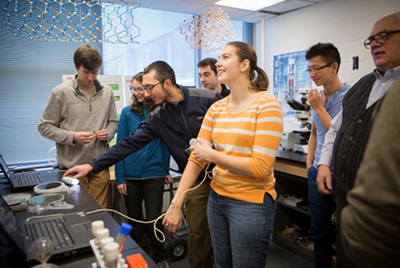 He volunteered to take part in an event at the Cornell Center for Materials Research for high school students, at the request of his labmate, and his demonstration of the laser capture microdissection microscope he used turned out to be a revelation, both for the students and for himself. “It was not much of an effort for me, it’s really just what I do every day,” said Shi, a second-year student in physics. “But afterward, all the students told me that they thought it was really cool; they couldn’t stop talking about it. Cornell is hoping to bring more “cool science” to young students in the area with the establishment of CNF Ambassadors, a new program being run by the Cornell NanoScale Science and Technology Facility. CNF staff members Lynn Rathbun and Beth Rhoades are coordinating the effort, which so far has attracted 12 grad students to engage with area K-12 students. Seven of the volunteers took part in orientation in mid-December in the Duffield Hall Demo Room; the rest of the participants will get their introduction to the ambassador program in January. Rathbun said that Cornell graduate students have engaged in outreach in the past, and the new program will give greater structure to the effort and make more efficient use of the volunteer help. Initially, the student ambassadors will engage with children visiting CNF, but eventually they will give demonstrations at area schools. The ambassadors will lead school groups, 4-H activities and summer campers as well as children taking part in NanoDays, an annual weeklong festival of educational programs about nanoscale science and engineering sponsored by the National Science Foundation. The 2016 NanoDays celebration is slated for March 26-April 3. Melanie-Claire Mallison, CNF’s public relations associate, said the CNF attracts approximately 2,000 visitors a year, many of them young people. She said she’s excited about the possibilities that arise when developing minds are exposed to new ideas. Grad student Shi saw the effect his outreach had on young people who might never have been exposed to his type of work otherwise. Fellow CNF Ambassadors volunteer Ryan Badman’s first exposure to outreach came at the other end of the interaction. The graduate of nearby Jordan-Elbridge High, outside of Syracuse, took a summer physics program at Syracuse University, where his father, Lee, works as an adjunct. Alex Ruyack from Brewster, New York, a student in electrical and computer engineering, said that he got involved in outreach while in high school, conducting weekly science experiments for elementary schoolchildren.